The Derbyshire and Staffordshire Dove flows for 45 miles from its source at Dove Head, in the moors of the Peak District, to the village of Newton Solney (definitely not to be confused with Newton Tony (see People we Like)) where it meets the River Trent. It was on the Dove where Izaak Walton and Charles Cotton spent much of their fishing time. 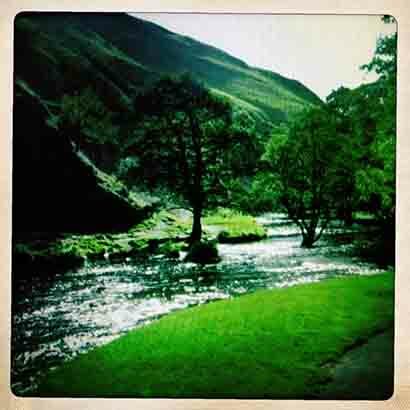 Here, they cast for the trout and grayling of the sparkling Upper reaches and Cotton’s Fishing House still remains on the riverbank. Today, they would gawp at the size of some of the fish that are taken from further downstream. The Dove is now renowned for its barbel, and though not present in such quantity as a river such as the Wye (see Bits and Pieces Issue 31), here swim some of the biggest fish in the country. There are enormous chub as well, with specimens in excess of seven pounds, while perch have been caught to nearly five. There does seem to be confusion as to the etymology of The Dove. Some suggest it comes from the Old English word ‘dof’, meaning tame, yet the river is anything but. What does seem certain is that the modern pronunciation is wrong. It should rhyme with ‘rove’, as many locals still refer.